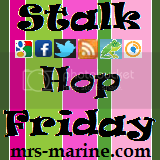 I'm sorry to say, I have not had time to keep up with Stalk Hop Friday for quite some time. I have finally decided the Hop will be taking a break. I'm not sure for how long, but I thoroughly enjoyed hosting it so it will be back! As always if you follow me in any way let me know and I will return the follow! Happy Hopping! I hope you are well & understand the need for a break! I hope you'll join me for Friendship Friday at Create With Joy! Thanks for letting us know, but I'll be back to say hello and I hope you'll stop by too! Hello! I just popped by to join your stalk and you've gone away! LOL, I am stalking you anyway. I love your bright and beautiful site...and the pictures of those cute little kitties too! You have a new follower!